ANN ARBOR, MICHIGAN // Apr. 8, 2019 – HistoSonics, developer of a non-invasive robotics platform and novel beam therapy, announced today that it has closed a $54 million Series C financing. The round was led by Varian Medical Systems, Inc., the global leader in radiation therapy and oncology solutions, and included healthcare investors Johnson & Johnson Innovation – JJDC, Inc. (JJDC), Lumira Ventures, Venture Investors, the State of Wisconsin Investment Board, as well as participation from existing investors. 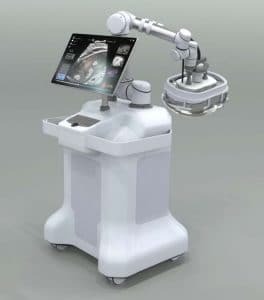 The financing also included robotics pioneer Fred Moll, M.D., founder of Intuitive Surgical and Chairman and CEO of Auris Health. HistoSonics plans to use the proceeds of the financing to complete key regulatory and commercial milestones and expand development of its breakthrough platform. HistoSonics’ non-invasive platform, Robotically Assisted Sonic Therapy (RAST)™, combines advanced robotics and imaging with proprietary sensing technology to deliver personalized treatments with unparalleled precision and control, and uses the science of histotripsy and focused sound energy to generate pressures strong enough to liquify and completely destroy targeted tissues at sub-cellular levels. The company believes that the novel mechanism of action of their proprietary technology provides significant advantages to patients, including the ability of the treatment site to recover and heal quickly, as well as provides physicians the unique ability to monitor the destruction of tissue under continuous real-time visualization and control, unlike any modality that exists today. The new financing follows a year of impressive progress at HistoSonics. The company achieved significant development milestones and generated compelling early clinical evidence, as well as continued to add deep domain experience and industry leadership to its team. HistoSonics was also recognized as one of the most promising start-ups with a top 10 ranking in The Observer’s “Top 20 Flyover Tech”. Read the full article here. HistoSonics is a venture-backed medical device company developing a non-invasive robotic platform and novel beam therapy, Robotically Assisted Sonic Therapy (RAST)™ . RAST™ uses the science of histotripsy and the pressure created by focused sound energy to liquify and destroy targeted tissue, including diseased tissue and tumors, at sub-cellular levels. The company’s new platform deliverers personalized, tissue specific treatments with unparalleled precision and control, and without the undesirable side effects of many of today’s interventional and surgical modalities. Histotripsy was developed at the University of Michigan and exclusively licensed to HistoSonics. The company is led by a team of experienced domain experts and industry leaders with offices in Ann Arbor, Michigan and Minneapolis, MN.